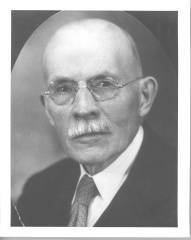 Info Luren Dudley Dickinson, governor of Michigan from 1939 to 1940, enjoyed an unusual career in several respects. He served a record seven times as the state's lieutenant governor. He remains the oldest person-at age 79--to serve as Michigan's governor. He appointed the state's first woman lieutenant governor, Matilda Wilson. He is the only person to step into the highest office in Michigan upon death of an incumbent governor. And he is also notable in another way: as governor he maintained an unusually intimate tie between the Capitol in Lansing and his rural farmhouse home just outside Charlotte. Luren Dickinson was born in Niagara County, New York, on April 15, 1859. When he was only a year old, his family moved to Michigan. His father was a farmer and, in 1864, the family settled on land in Eaton Township near Charlotte. That land-30 acres at the start, later expanded to almost 250 acres-remained Dickinson's home for the rest of his life and played an enormous role in shaping his life and career. As a boy, Dickinson worked hard on the family farm. Although education was important, he could only attend school half time. Later, by paying his own tuition and books and walking three miles to Charlotte, he was able to attend high school. Eventually, studying at home and putting in twelve-hour days on the farm, he qualified to become a teacher. He began teaching at eighteen, earning a salary of $25 per month. He taught for nineteen terms, often working on the farm in the summer. He rose quickly in the profession. He was named principal of Potterville High School and, at the age of 21, superintendent of schools. This seems to have been his introduction to another career: a political career, a career he pursued or--more accurately--a career which seemed to pursue him for the next sixty years. People meeting him for the first time were impressed by his kindness, his keen, dry humor, and his genuine piety which is shown in his desire to look for the best in people.